Note: Amanda Stuckey is a pedagogical development consultant for the WWP. For my Fall 2017 LIT 200 Literary and Textual Analysis course, I wanted to combine coursework with a project I’ve taken on as the Digital Coordinator for Legacy: A Journal of American Women Writers, the only scholarly journal to focus specifically on recovering American women’s writing, broadly defined, from the seventeenth through the early twentieth centuries. During the coming year, I aim to revise a unique feature of Legacy’s website: Portrait Galleries that offer biographical, bibliographical, and research information for over one hundred American women writers. In bringing this project to LIT 200, I saw an opportunity to introduce more project-based literature assignments, as well as to expose students to the digital work of recovering women’s voices in literature. 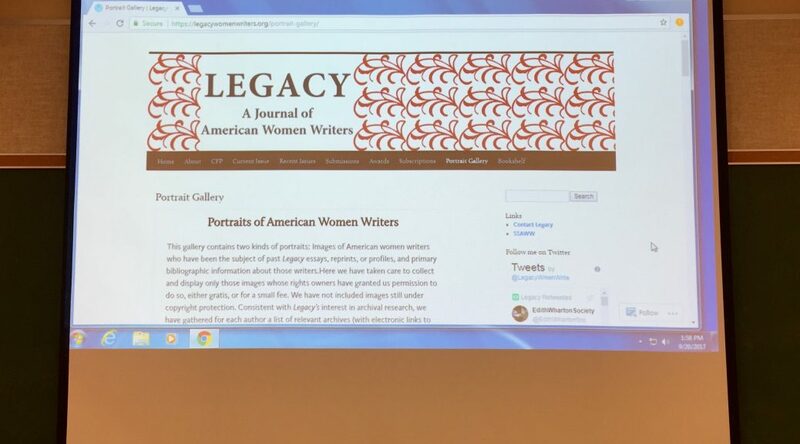 It wasn’t until I discovered Women Writers Online (WWO), however, that I began to envision an informal partnership between Legacy’s Portrait Galleries and the broader work of recovery in which the Women Writers Project is engaged. My overall goal for LIT 200, a course geared for non-majors, was to expose students to the field of literary studies and to equip them with a toolkit of literary methods – such as close reading, applying critical concepts to primary texts, and responsibly using and citing sources – that they could transfer to other courses and learning situations. Our syllabus, designed before I incorporated the Legacy project and WWO into our semester, did not contain readings from either digital collection, and was structured according to the thematic frame of Voices in World Literature. Because the Legacy project and WWO came into LIT 200 at different times and for different reasons, the challenge of the semester was to make all the pieces fit together for a diverse group of students—many of whom, on the first day of LIT 200, were also sitting in their very first college classroom. We used the Legacy project and WWO to introduce and experience the importance of digital tools in the literary methods of recovery, in particular in the methods of recovering and making accessible women’s voices—missions that Legacy and WWO hold in common. In this way, we were able to connect our course practice of reading how and where voices, in particular women’s voices, are represented in literature, to methodological and research practices of actually recovering these voices. In our course readings, we traced how some voices emerge, change, and ring out, and how other voices are suppressed, silenced, or cut off. We introduced course readings with the question of where we heard, saw, or otherwise discerned women’s voices in literary texts—and of how different forces within our texts changed, shaped, or suppressed these voices. For example, one of our “anchor” course readings was Ovid’s tale of Pygmalion, from Book X of his Metamorphoses (8 AD). We returned to this mythical telling as a kind of touchstone throughout the semester for other texts, such as Bernard Shaw’s play Pygmalion (1914) and the 1964 musical film adaptation My Fair Lady. Focusing on revisions and interpretations of the same tale allowed us to isolate revisions and interpretations of women’s voices and women’s relationships to literary and artistic production. The Legacy Project and WWO extended our search for and interpretation of women’s voices because each resource allowed us to discuss a similar concept: the status, emergence, suppression, and liberation of women’s voices, this time in the digital archive. In our readings, we talked about how women’s voices are often buried within male-authored texts as well as within the layers of the plot or narrative. So while we often saw the silencing of women’s voices in literature, we also worked in our Legacy project with WWO to recover the voices and literary lives of women writers. Thus we linked WWO to course readings not in terms of authorship but in terms of our interpretive strategies, or how we read and analyzed course materials. The parameters of our project-based Legacy and WWO assignment were deliberately flexible in order to allow for exploration, discovery, and even productive frustration. Students worked in groups to produce a collaborative document – often as simple as a shared Google doc – that served as a “Shadow Portrait” for each of the authors represented in Legacy’s Galleries, ranging from María Amparo Ruiz de Burton to Jessie Fauset to Harriet Beecher Stowe. These Shadow Portraits consisted of a narrative describing the digital record that currently exists for each author, including which links worked, which were broken, and cases in which an author’s papers had relocated or had even been digitized. Groups also did a bit of digging around linked websites or other sources – including WWO – to compile a more complete bibliography for each author. While we did spend class time exploring WWO alongside the Legacy Portrait Galleries, I found that the most illuminating moments came as students ran into issues with the digital record of Legacy’s Portraits, from barriers as mundane as a broken link to those as significant as the absence of a physical archive of an author’s papers. Although creating a narrative of this work may have seemed tedious, I found that narrating their thought, clicking, and sleuthing processes allowed students to understand the work of recovery in the digital age. Some of the most interesting questions came when groups examined the locations of women writers’ papers. We found that, like Higgins’s Eliza, women’s voices were often shaped by the authorial and archival dominance of male authors, husbands, publishers, and relatives. We also considered the ways in which broken links, moved papers, or outdated information can, in the digital age, create a new kinds of archival presences and absences. And in a practical sense, these Shadow Portraits gave me a better idea of the status of the Portrait Galleries, of where to begin in revisions, and of how the feature might be useful to Legacy’s readers and classrooms. In the Fall semester’s version of LIT 200’s Legacy project, WWO served as a key interpretive tool (not to mention as an exemplar and resource for digital scholarship) for framing both our course readings and our project-based assignments like Legacy’s Portrait Gallery research. In terms of course outcomes, beyond the Shadow Portraits I was thrilled to see students use their comfort level with digital spaces as an entry point for the work of literary studies. The Legacy Portrait Galleries were developed almost ten years ago, and the format of WWO allowed us to assess changing values in the field of digital literary scholarship and recovery. Comparing Legacy’s Portrait Galleries to WWO and to the WWP gave students a contemporary history of scholarship on women writers, emphasizing recovery as an ongoing, unfinished process. Overall, the combination of LIT 200, the Legacy Project, and WWO illuminated the diverse uses of a collection like the WWP. While we used WWO to understand rare or inaccessible materials on a conceptual level, even though we did not dive into these texts specifically, the collection gave students exposure to these concepts. Throughout the project, I reminded students that in working with Legacy and WWO, we were not just completing coursework but were actually contributing to the field of literary studies. I also believe our work with Legacy and WWO demonstrated to students the social intervention of recovering women’s voices both in archival and interpretative frameworks. Rather than just a supplemental project to course readings, WWO allowed students to experience recovery work as an interpretive tool for our texts, demonstrating how recovery can change not only the canon but also the way we study literary representation and production.